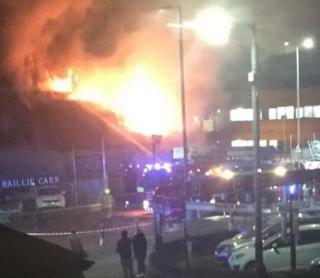 Firefighters have tackled a "well-developed" blaze at a business in Glasgow. Crews were called to the Tollcross area in the east of the city at about 20:15 on Saturday. Local people said the blaze happened at an accountants office. Scottish Fire and Rescue said four appliances and an aerial platform attended. They also confirmed there were no casualties. Fire crews left the scene on Sunday morning. scene, where crews tackled a well-developed fire within a two-storey business premises."